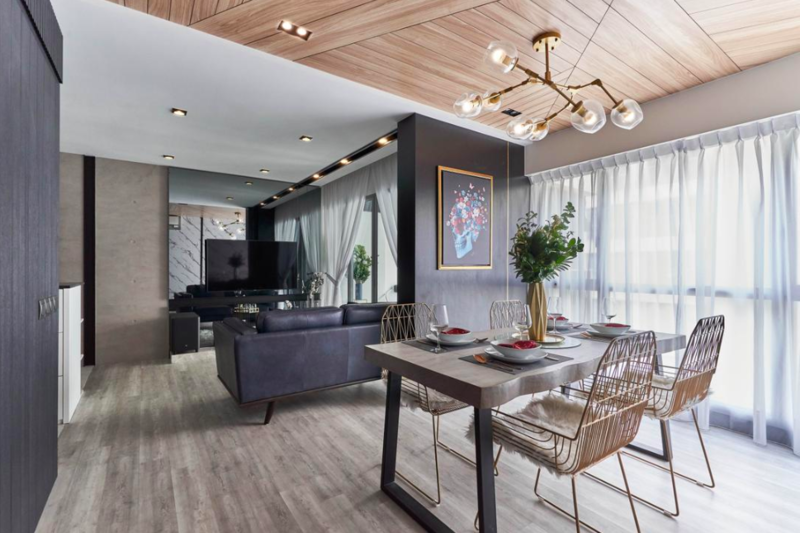 Well known for its raw masculinity and heavy use of rustic decor elements, such as natural wood and exposed concrete, the industrial style of decor differs largely from its modern-luxe counterpart in that it conveys a rough and ready feel. 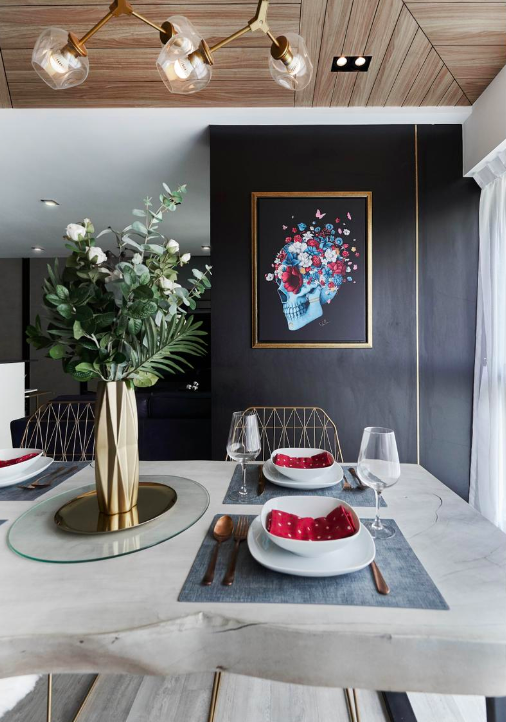 So when Rockin Spaces designers Renee and Jeffrey took up the job of renovating this 4-room resale HDB flat in Tampines, their biggest challenge was to create a coherent look that combines design elements from both styles. "It was difficult because the husband prefers the luxe look, while the wife likes the 'manliness' of the industrial style," recounts Renee. "Both Jeffrey and I had to crack our heads over how to mix the features (from both styles) and come up with something that looks consistent." 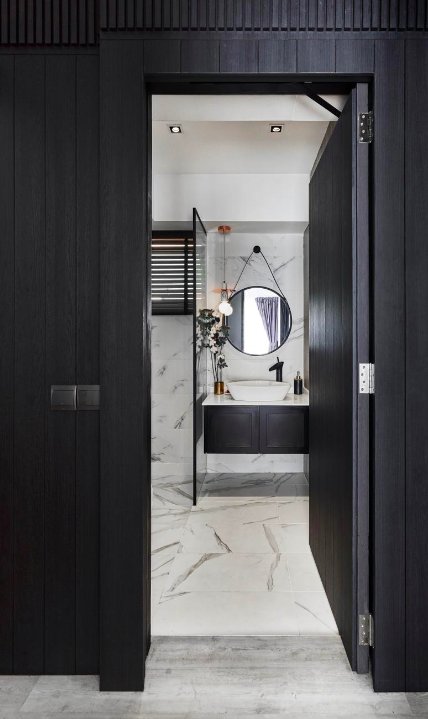 That said, anyone would find it hard to deny the perfection of the final result - especially after seeing how the joint aesthetic manages to achieve sophisticated elegance through a combination of raw masculine elements and refined details. "The entire process was fairly challenging for us," says Jeffrey about his firm's latest project. "I am just glad that we managed to create something that everyone likes." To achieve a balance between what would have been two contrasting design styles, Renee and Jeffrey made full use of wood and metal - two materials that are common to both industrial and modern-luxe homes. "Depending on how they are used, wood and metal can create either a raw or polished look, or something that's a mixture of both," explains Renee. 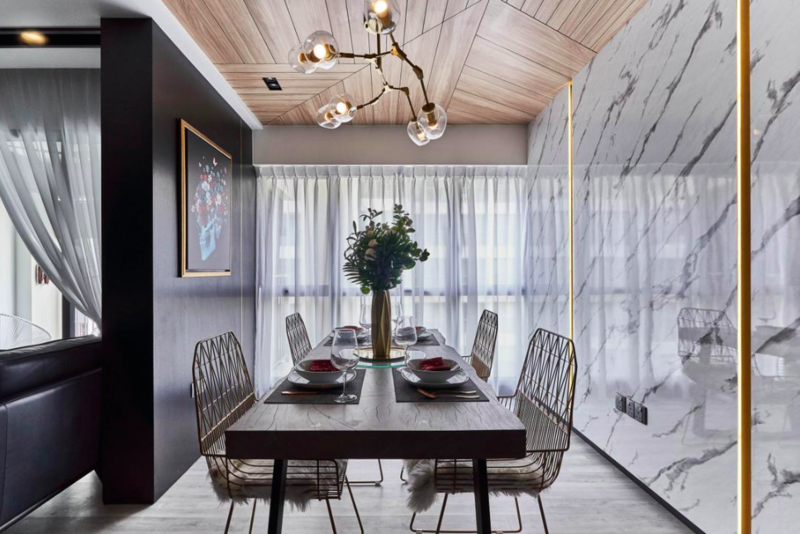 For instance, in the dining area - which was formerly a bedroom - wood effect vinyl flooring and panelled carpentry laminates (installed on the ceiling) were paired with metallic accents as well as a marble laminate accent wall to evoke a classy image with a subtle hint of rusticity. "The owners really like the dining area because of its openness," shares Renee. 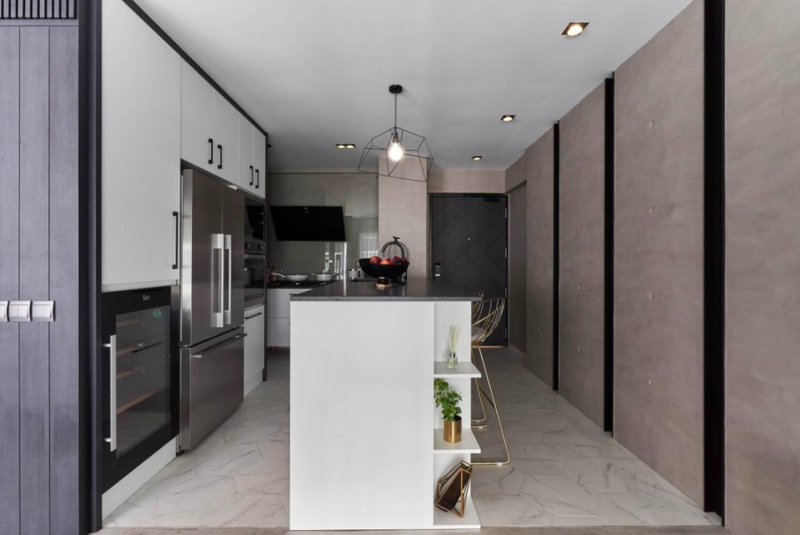 "The idea was to create a space that feels like a proper 'room' instead of the cosy corners like those you see in HDB flats nowadays. If the owners didn't have this area, it would be hard for them to host when their friends and family visit." During the initial discussion, one thing that everyone quickly came to a consensus on was the kitchen's design. "Both the owners and us agreed that the kitchen had to be opened up," says Jeffrey. "The original walkway was so small that it could only fit one person at a time!" 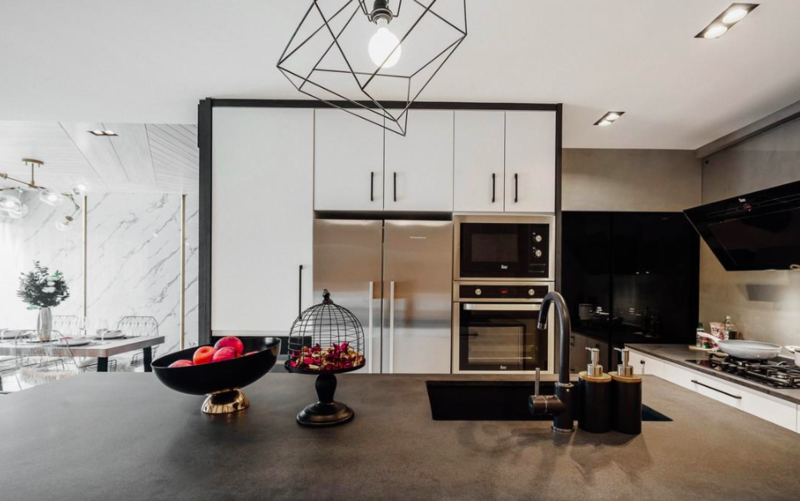 Other than doing away with its exterior, the revamp also saw the installation of new fittings and fixtures; the most prominent being a granite-topped island that runs parallel to the living room's feature wall - an equally notable feature in of itself, because of how its plastered surface perfectly replicates the look and feel of actual concrete. 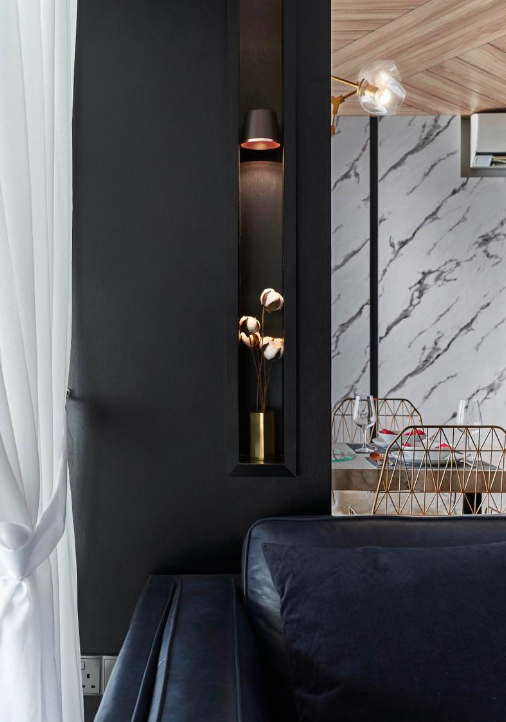 In contrast to its concealed counterpart, the master bedroom's en suite was was overhauled to create a seamless look reminiscent of a luxury hotel's own. "The wood panels that you see are actually water-resistant laminates from Admira," says Renee. "We also installed a suspended water closet because it would be easier to wash the back of the toilet. The (toilet's) water tank is hidden behind the rear 'ledge' which extends outwards from the bathroom's actual wall." This very same trick was used to conceal the rain shower's pipework as well. 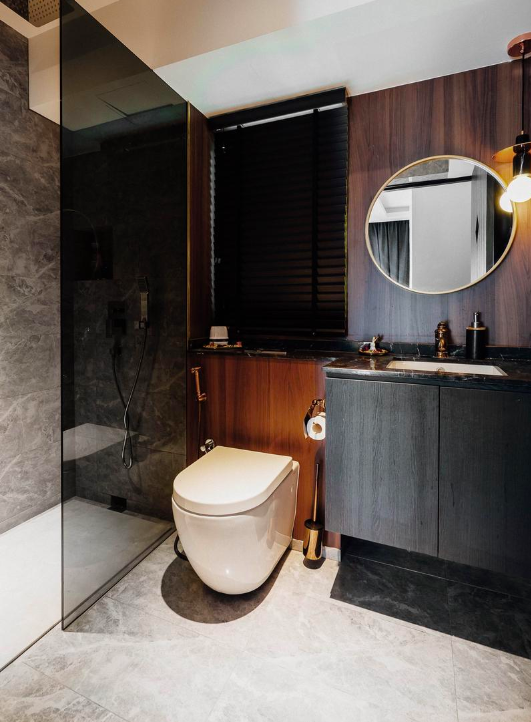 "You can't see the pipes because they are hidden in the false ceiling, and that makes it look like the shower head is connected directly to the top," she reveals. 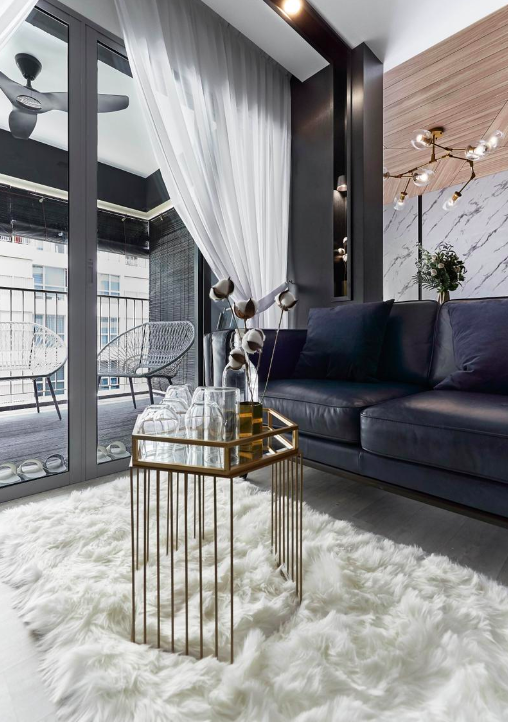 "Because it couldn't be hacked off, we ended up creating a display niche by wrapping the pillar with laminates and building a light inside of the recess," says Renee. "It's something that both owners agree is a nice touch."